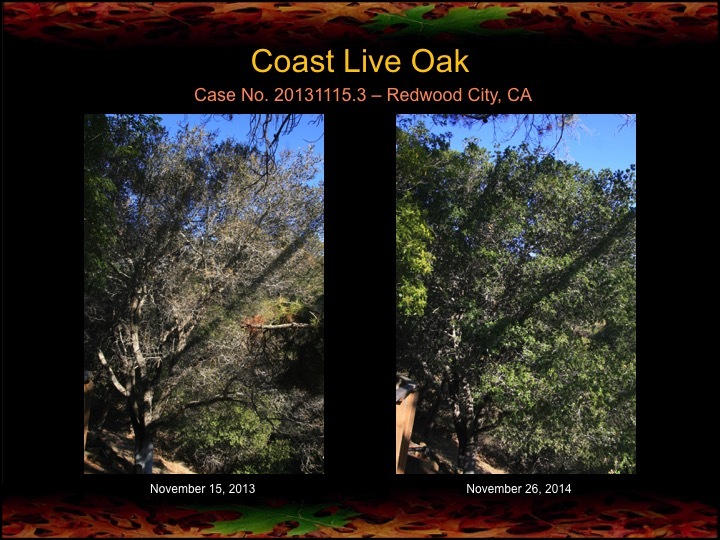 In November of 2013 I met with a property owner in Redwood City, CA who had some rather sick coast live oak trees. His wife had alerted him my work with fire mimicry and he was interested, though quite skeptical, of my approach to helping oaks. I provided a report of my findings and recommendations, and he responded with a number of good questions, showing me that he had done his homework on the subject. In the end he opted to try my approach, noting that his decision was swayed by the fact that the mineral and compost fertilizers I apply are all natural, non-toxic compounds typically used in organic agriculture. One year later, in November of 2014, we met again as I did my annual inspection his treated oaks. Even before I had time to re-photograph the trees he admitted he had seen significant improvement in several oaks, and was no longer a skeptic of my work. Bear in mind that these photos show the treated oaks after only one year’s time. A few oaks show no noticeable improvement in canopy density or greenness, nor do they show any noticeable decline. 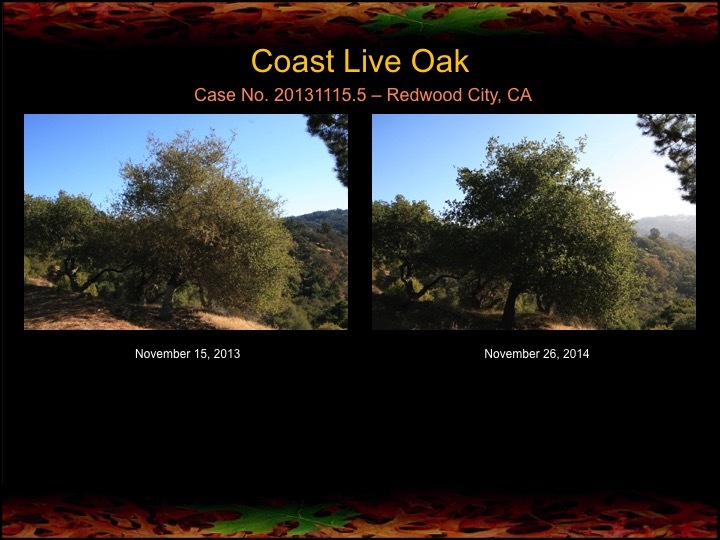 Other oaks have responded with clear improvement in canopy density and greenness. Needless to say, the owner opted to treat his oaks again, and we’ll see their response again next year . . .